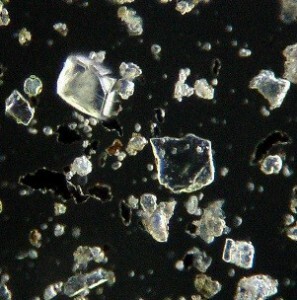 Volcanic ash is fine dust made from granulated volcanic rock (fine glass-like fragments that are less than 2mm in diameter). It is shaped similarly to glass, with sharp points (image A), and it may have components of volcanic gas (sulfide sulfur, hydrogen chloride, and hydrogen sulfide) attached. Please refer to the following information to prevent accidents and damage to your health. 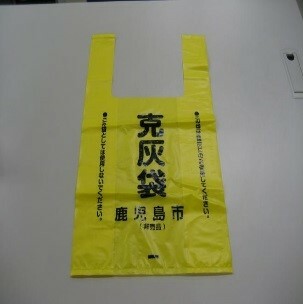 (a) If you go outside when there is heavy ash falling be sure to use a hat, a mask, long sleeves, and an umbrella etc. Even just using a towel to cover your mouth and nose will protect your lungs, bronchial tube, and other respiratory organs. (b) Gargle after returning indoors. (c) Volcanic ash can damage your cornea if it enters your eyes. If you get ash in your eyes, do not rub them and wash them with clean water or eye drops. It is recommended that you take out your contact lenses when ash is falling (and wear glasses instead). ◎ Motorcycles and bicycles can slip easily when ash falls. Be careful of accidents. ◎ Dispose of the ash on your balcony and front yard by placing it in a designated ash disposal area (image C). 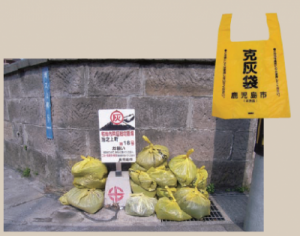 Please use a special bag for collecting volcanic ash (image B) or dispose of the ash in two layers of regular plastic bags from the supermarket. Ash can cause flooding in the event of heavy rain so do not pour the ash down a drain/gutter etc. ◎ The direction of the wind determines where ash falls. TV stations forecast the direction of the wind above Sakurajima after weather reports. You can refer to this forecast to find out where the ash will fall. 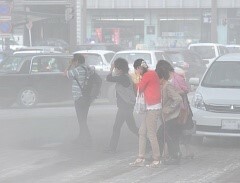 As it gets warmer ash often falls on Kagoshima City. ◎ In 2011 the infrasound (空振 KUSHIN / shockwaves from an eruption that cause vibrations in the air) produced by an explosive eruption of Shinmoedake in Miyazaki 2011 broke the glass of windows that were 12km away. For counter-measures, apply shatter-resistant sheets and thick curtains to windows and do not allow small children to sleep under windows.